Unley Primary students in conjunction with staff and the Education and Wellbeing Committee are excited to share with families the 74 Fun Things To Do Out Of School resource. The aim of this list is to give families suggestions of activities, both creative and functional, that enhance students’ learning. This resource has been developed to complement our school homework policy which values the inherent learning opportunities in shared family time and creative leisure pursuits. For further information, see our school homework policy which can be found on the school website. When we started this list, we imagined a total of 25 things… It is testament to the enthusiasm and imagination of the UPS students that the list has grown to 74! 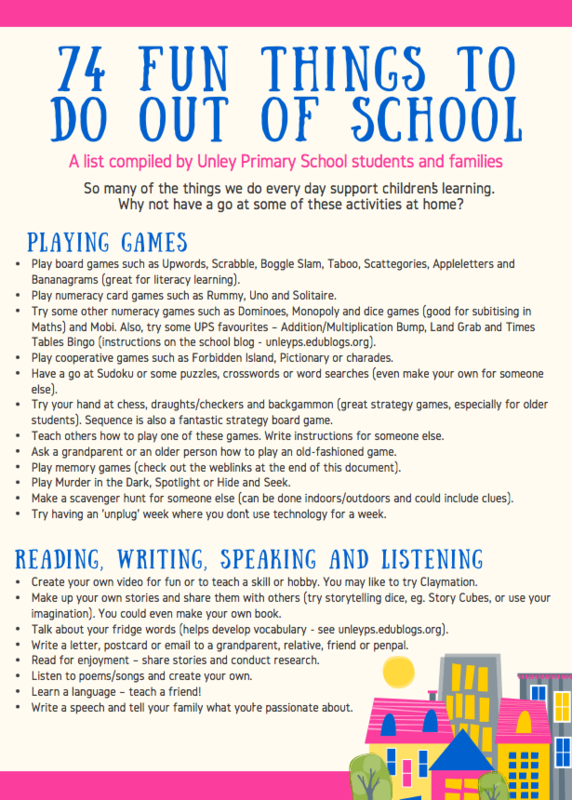 In keeping with the accepted wisdom that children learn best when schools and families work in partnership, we hope this list will serve as inspiration for a whole range of ways to make home learning fun, real and engaging – and that it becomes the springboard for lots of new creative ideas. Over the next few months, we will be posting further details on some of these ideas. Please feel free to share with us any other activities that you and your family have found beneficial – we would love to hear from you.